United Nations Ambassador Nikki Haley said in a new interview she's "not even thinking" about running for president in 2024. 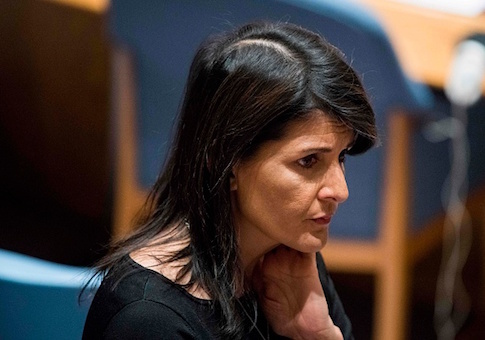 Haley announced in October she would step down at the end of the year from her post at the U.N., stirring speculation about the popular Republican's political future. A two-term governor of South Carolina before joining the Trump administration, Haley announced she was stepping down with high approval ratings and a promise to support President Donald Trump in his re-election bid in 2020. At the end of Uri Friedman's interview with her for The Atlantic, the reporter asked Haley what her campaign slogan would be in 2024. Assuming Trump runs for re-election in 2020, that would be the next year of a truly open Republican primary. "Truly no one believes me: I am not even thinking about it," Haley said. "You know what I think about? I think about sleeping in. I do. I think about sleeping in, I think about binge watching TV for a day, I think about not having the stress level that I’ve had for the last eight years. For the last eight years, seven days a week, I always pick up my phone with a pit in my stomach, worrying that something bad is gonna happen. And I wait for the day when I don’t have to be so scared of my phone. That’s the reality of it." Haley told The Weekly Standard she would remain in New York for the next two years so her son could finish high school there, and she wanted to remain an active voice on foreign policy. She also may write another book. Trump announced Friday he was nominating State Department spokeswoman Heather Nauert to replace Haley at the U.N. This entry was posted in National Security and tagged Donald Trump, Heather Nauert, Nikki Haley, Trump Administration, United Nations. Bookmark the permalink.